Once a week, a group of EAWs will assemble at someone’s guesthouse or compound to take part in a ritual that has become, for many, an almost spiritual substitute for religion. 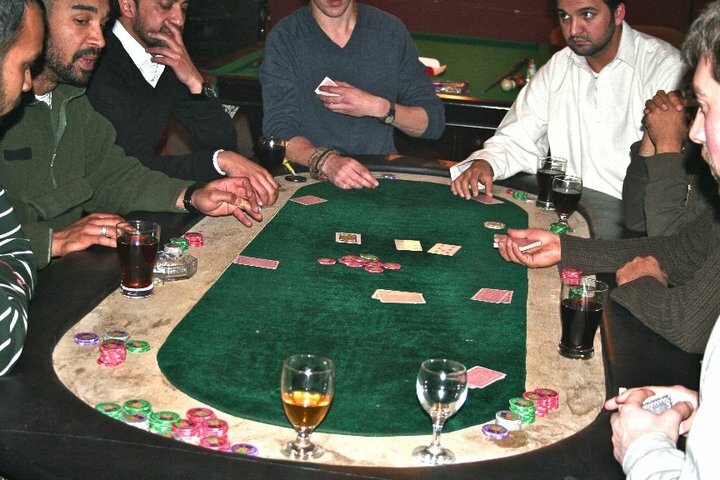 With its often bizarre assortment of characters and potential to gain huge levels of street cred (not to mention cash of often varying denominations, sorry chaps, I hope Swedish Kroner and Philippine Peso will do) the weekly poker night is an important staple in many an EAW’s social calendar. It’s the perfect place to sit in a fog of cigar and cigarette smoke, share a fresh bottle of imported whisky, and win or lose the equivalent monthly salary of your local driver in 3 minutes. Although money is a definite draw, it is unlikely that any inexperienced players will walk away with much at the end of the night thanks to a committed central cabal of players, who have inevitably been ‘in country’ longer than most and effectively earn a second income from baffling younger, more inexperienced players with the intricacies of the game. The players will be predominantly male, although it’s not unknown for a young femme fatale to turn up and hustle the old guard, perhaps by distracting them from play with her other assets. The older players will grin to themselves at the arrival of a pretty new face ripe for the picking, only to find themselves despondent and broke at the end of the night. A big win at poker will often leave the EAW with a swagger in their step for the rest of the week, and the benefits can often be felt by others. A crisp new dollar bill for the cute little street kid selling scarves, an extra large tip for the waiter. Inversely, a big loss will induce a miserly effect, and the EAW will be sure to count every penny and avoid unnecessary purchases. Spending winnings is also something that comes naturally to EAWs, after all, they spend most of their time spending other people’s money in benevolent ways, so if anyone knows how to splash some extra cash it should be them. The thrill that comes with gambling is heightened by the surroundings, bonus points for a war zone, which helps EAWs get over any stigmas involved. After all, by being in such a dangerous place an EAW is already ‘gambling’ with his life, why not take it the next step? At the end of the night, players will divvy up the cash and say their goodbyes. Win or lose, there’s always the potential to do better next week, and maybe, just maybe, that cutie sitting across the table and giving you ‘the eye’ will return. You could certainly do with getting your $200 back from her.